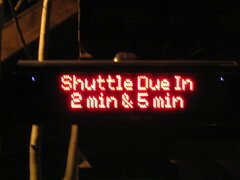 Google announced that they’ve added more public transit information, including schedules in select markets. I still want to see Google incorporate real-time information, similar to what is available from the WMATA for the DC Metro system. 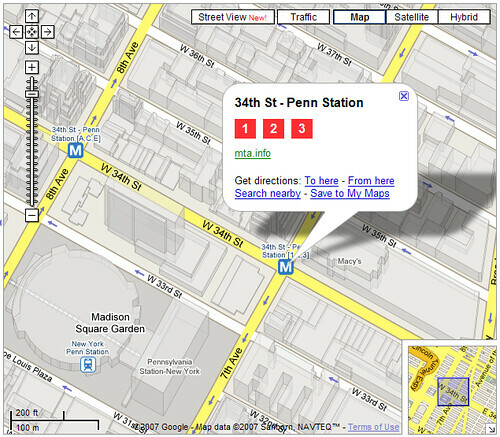 Throughout the country, Google has added the lines served to transit stations. You can also search an area for a station. For example, here’s a search for “Metro Center station”. That alone is nice, but it gets better. I often go in to DC to have lunch with friends who work near the McPherson Square station. Here’s a map of restaurants near McPherson Square. Of the online map providers, Google has done the best job of making maps about more than just driving. Some public transit agencies and companies like NextBus have been offering information on their Web sites, on the phone and on the platforms. But its the distribution power of Google that’s going to bring this to the masses. Unfortunately, the transit information isn’t yet available on Google Maps Mobile. The killer app for transit information is really on mobile devices. This entry was posted in google, maps, mobile, mobile search, transit, wireless, wireless data. Bookmark the permalink. Do you have a map of the JR train line in Japan for the ipod touch? It’s appropriate time to make a few plans for the future and it is time to be happy. I’ve learn this publish and if I may I want to recommend you few attention-grabbing issues or suggestions. Perhaps you can write subsequent articles relating to this article. I want to learn more things approximately it! Hello there, just became aware of your blog through Google, and found that it is really informative. I am gonna watch out for brussels. I�ll be grateful if you continue this in future. Numerous people will be benefited from your writing. Cheers! hey there and thank you for your info � I�ve definitely picked up anything new from right here. I did however expertise some technical issues using this website, since I experienced to reload the site lots of times previous to I could get it to load correctly. I had been wondering if your web hosting is OK? Not that I am complaining, but sluggish loading instances times will very frequently affect your placement in google and could damage your high-quality score if advertising and marketing with Adwords. Well I am adding this RSS to my email and could look out for much more of your respective exciting content. Ensure that you update this again very soon.. Fantastic goods from you, man. I’ve understand your stuff previous to and you’re just too great. I really like what you’ve acquired here, certainly like what you are stating and the way in which you say it. You make it entertaining and you still take care of to keep it wise. I cant wait to read much more from you. This is really a great web site. I like the helpful info you provide in your articles. I will bookmark your weblog and check again here frequently. I am quite sure I�ll learn plenty of new stuff right here! Best of luck for the next! Simply desire to say your article is as astounding. The clearness in your post is just spectacular and i can assume you’re an expert on this subject. Well with your permission let me to grab your RSS feed to keep up to date with forthcoming post. Thanks a million and please carry on the rewarding work. I’m extremely impressed with your writing skills as well as with the layout on your weblog. Is this a paid theme or did you customize it yourself? Anyway keep up the excellent quality writing, it�s rare to see a great blog like this one today.. Attractive section of content. I just stumbled upon your site and in accession capital to assert that I acquire in fact enjoyed account your blog posts. Any way I�ll be subscribing to your augment and even I achievement you access consistently fast. I don�t even know how I ended up here, but I thought this post was good. I don’t know who you are but definitely you’re going to a famous blogger if you are not already 😉 Cheers! Hmm it seems like your blog ate my first comment (it was super long) so I guess I’ll just sum it up what I wrote and say, I’m thoroughly enjoying your blog. I as well am an aspiring blog writer but I’m still new to the whole thing. Do you have any suggestions for newbie blog writers? I’d really appreciate it.